This is a rare and special year. The first day of Hanukkah is also Christmas Day! the Jews cleansed and rededicated the Temple on the 25th day of Kislev, which is usually in our month of December. 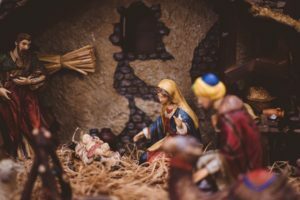 (Many believe that the date of December 25 is derived from this holy day of temple dedication, meaning that many believed Jesus was born on the day of dedication!) As part of the temple rededication, a makeshift menorah was devised to illumine the Holy Place because the original had been destroyed. Only one vial of the sacred, pure oil was found to light that menorah. Miraculously, the one vial lasted eight days until more oil could be produced. 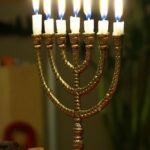 Hanukkah, therefore, is also called the Festival of Lights during which one candle per day of a special menorah with eight candles, representing the eight days, is lit in remembrance of the miracle. So, this year, the first day of the Feast of Dedication (of the Holy Temple), which is also called the Festival of Lights (illuminating the Holy Place of the Temple) , falls on the same day that believers in Yeshua celebrate the Holy Night when the angels sang, “Glory to God in the highest!” What a beautiful season to remember and worship the Lord! In these dark times, O how we need the Light of the World, the “Savior, who is Christ the Lord!” And O how the world needs the followers of Messiah to dedicate themselves and live as Kingdom citizens. Every year, December 25 comes right after the darkest day of the year, aka the winter solstice. And every year, just as there is a glimmer of increasing light in the form of longer days, we get to rededicate the temples of our own bodies (1 Corinthians 6:19-20) to the Light of the World who came to lead and empower us to give glory to God with every attitude, thought, word, and action.